McALLEN — Two cakes and a bowl of punch sent off now-former District 1 Commissioner Richard Cortez and welcomed newly elected District 1 Commissioner Javier Villalobos on Monday. 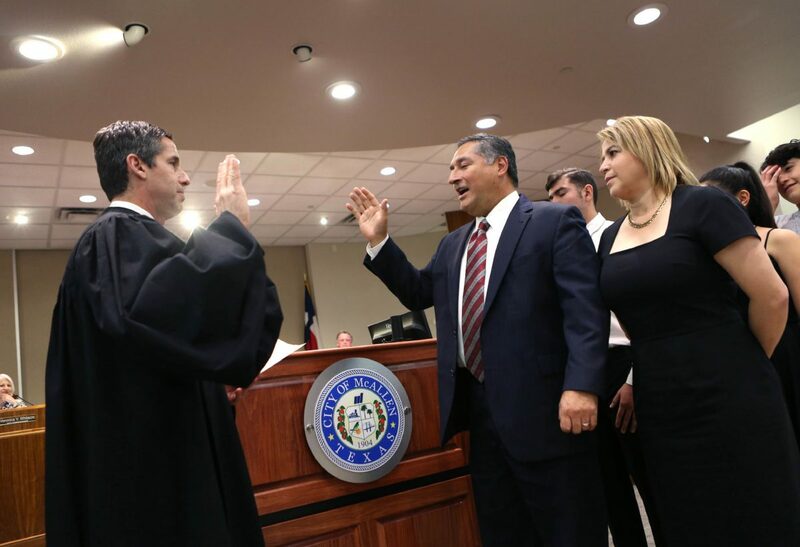 Cortez, who also served as mayor from 2005-13, briefly thanked the commission before handing over the District 1 seat to Villalobos, who was sworn in at the beginning of Monday’s commission meeting by U.S. District Judge Randy Crane. “You’ll move on to bigger and… different things,” Mayor Jim Darling said with a laugh. Cortez recently won the Democratic primary bid for Hidalgo County Judge. Cortez running for that county post required him to give up his commission seat, which he won in a May re-election bid. 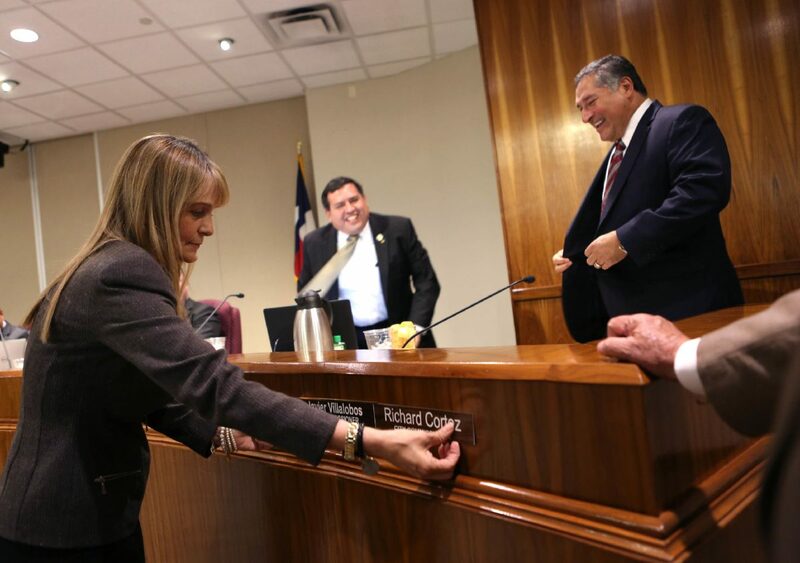 Carolina Teran replaces Richard Cortez's city commission name plate with Javier Villalobos' as Villalobos takes his seat after being sworn into the district 1 chair Monday, March 12, 2018, in McAllen. Villalobos, currently the Donna City Attorney, has worked in legal capacities with a myriad of municipalities over 19 years. He has also served as Hidalgo County GOP Chair. Villalobos will serve the remainder of Cortez’s term, which expires in 2021. There was a special election Jan. 20 featuring three candidates, but none secured more than 50 percent of the vote, causing a runoff. On the March 3 runoff election, Villalobos beat businessman Timothy Wilkins where he received 942 votes (56 percent) compared to Wilkins’ (44 percent). Of those 942 votes, 767 were cast during early voting, 147 were cast the day of the election and 28 were mailed in. Villalobos had a contingent of family and friends on hand, receiving multiple standing ovations. He first thanked his wife, Annette, and children, before thanking the voters during his quick remarks.